BATTLE WING BW501/502 tires are designed for growing number of committed adventure bikers looking for maximum sensation without sacrificing durability, stability, and all-weather grip. Rugged off-road looks with sportier on-road performance. 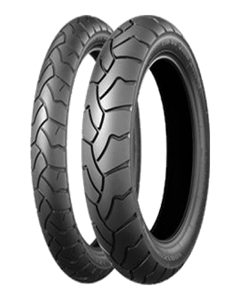 Incorporating the latest Bridgestone technology for adventure sport bikes. All-weather grip has been improved by center crossing diagonal grooves for both front and rear. The new profile and a series of angled base provide better, more sporty handling and contact feel with the road.